The University of Rio Grande and Rio Grande Community College hosted the fourth annual RISE event, a research and scholarship exhibition day for undergraduates to present projects they have worked on throughout the academic year. RIO GRANDE — The University of Rio Grande and Rio Grande Community College hosted the fourth annual RISE event last week in the John Berry Fine Arts Center. RISE is a research and scholarship exhibition day for undergraduates to present projects they have worked on throughout the academic year. Dr. Chad Duncan, assistant professor of psychology and RISE committee chair, said the event includes something for everyone to enjoy from panel discussions and poster presentations to music and theater performances. RISE is an opportunity for students to learn to present research and scholarship to prepare for their fields of study. To add to the fun of the day, faculty, staff and members of the boards of trustees judge the projects for several prizes awarded at the end of the day. Rio President Dr. Michelle Johnston, who was one of the day’s judges, said she enjoyed seeing the wide variety of unique research exhibitions students have been completing throughout the year. Students spend long hours completing research for their classes. RISE offers the students another opportunity to present their accomplishments to a larger audience. Student Senate President Kaylynn Bell presented her project, “ACL Grafts: The Best Fit for You,” with classmate Chelsy Slone to explain how different muscle graft options work best for different people and injuries to replace a torn ACL. 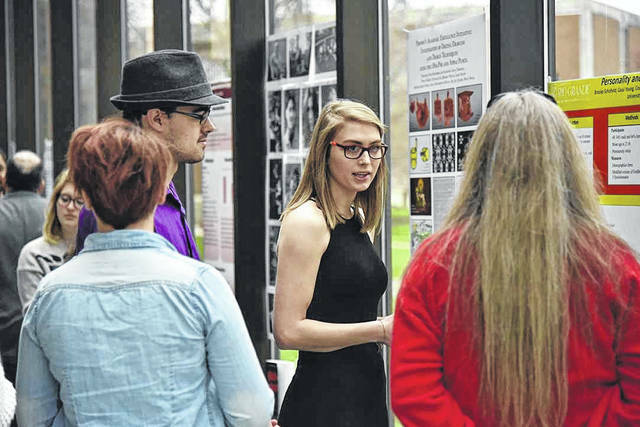 Bell, a junior sports and exercise science major from Hillsboro, Ohio, said she enjoyed sharing her project with faculty, staff and students from other departments and getting to see other students’ work as well. Duncan said he hopes to see even more excellent research presented at RISE throughout the upcoming years.